There is always the search for the best torrenting site, and at one point YIFY, YTS as it is also known, was filling those shoes very nicely. That was until YTS torrent site faced the same fate as many others like The Pirate Bay and KAT. This has left torrenters on a scramble, to find a replacement torrents website where they can go to get their favourite movies and TV shows. There are a number of YIFY proxy sites kicking around, and even the current version of YIFY is a mirror site. Here we will take a quick look at these, and then finally take a look at the 7 best alternatives to YIFY where you can go to download movies. YIFY is the alias of a now well-known pirate from New Zealand. They started to upload torrents to some of the top torrenting sites back in 2010. The initial goal of the YIFY movies downloads was to make Hollywood movies accessible to the public, in the smallest possible file size. It wasn’t just the use of X264 that allowed superior quality and optimal file size, it was the way YIFY movies were presented that was making it popular among users. From easy searching with high-quality covers, to the final movie file, was carried out in a professional manner. This led to clones or mirrors springing up trying to emulate the original YIFY, and now they have gone, these YTS, YIFY copies are seen as the original YTS torrent site. It was well-known at the time that users could safely download movies from the original YIFY torrent site with little worry, but as this is no more, this safety net is no longer there. Aside from this, it is not really safe to download any torrents, no matter where they come from. ISP’s and agencies working on behalf of Hollywood studios are always on the lookout for sites and users of torrents. Here are the top 7 proxies you can use. These will all have the appearance of the YIFY movies site, but where they actually point to is unknown. These are the top 7 YIFY mirrors or clones you can currently find on the net. With both of the above, you might find they have broken links, or the sites are very slow to load. This can change on a daily basis because the ISP’s and governing bodies are watching these links and copies as much as they did the original site. Now, this is the crux of the matter, what are the 7 best YIFY alternatives? These are not only the best alternatives for YIFY, but they are also some of the best torrent sites full stop. This is one of the oldest torrenting sites going, and from the look of the website layout, you can easily tell. It has a kind of retro feel to it, but this shouldn’t detract users away from the fact it delivers high-quality torrents. RARBG might not be updated with masses of new content links, but what it does deliver, is always top rated and there are hardly any fake files to be found. You can find it blocked in a few countries around the globe, but this is easily remedied when we get to the section about VPN’s. It has plenty of specialist categories, and it is effortless to use and navigate. To access this site, you will need to use this link: https://www.limetorrents.info/. It might not appear to be linked to a torrent site, but it is one of the tips and tricks torrent sites use to remain undetected (for now). This was a hugely popular torrent site for movie torrents, and pretty much anything else you were looking for. But, it followed in the footsteps of the PB and also YIFY, and was shut down. But, the original team are back, and the site has been revived with a new URL. It is hard to say if it is the original, or it is purely a Kickass torrents copy, but it is delivering quality content again. Because nothing much has changed, this can be one of the best torrenting sites that stands a chance of replacing YIFY. This was the site that picked up the pieces after KAT was shut down. This was also a benefit to the torrenting community at the time. Users flooded to this site and quickly found it was doing something to protect their privacy. Any connection logs were being deleted after 24-hours, so even if any governing body or ISP check the site, this is no use after this period. This being said, it doesn’t stop ISP’s checking where users visited, that information they do have. It is straightforward to use, and at its heart, it is only a torrent index, but the way information is provided and laid out, you would think they were holding the content. One thing it does do is to split files into quality settings which is a nice touch. 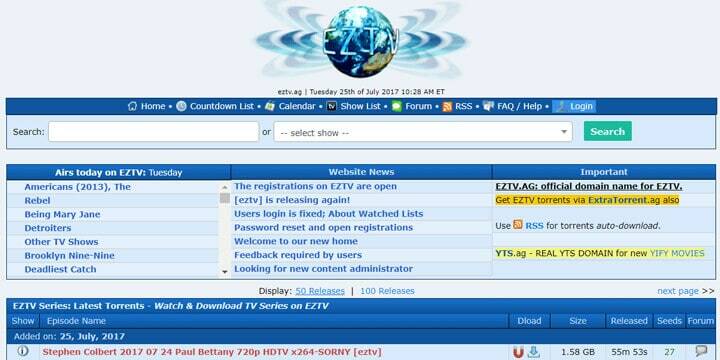 Back in 2015, the site was taken ‘hostage’ by a hacker, but since then, this has been resolved, and EZTV.ag is up and running, but under a new domain. For lovers of TV shows rather than movies, this is the site to go to. The interface isn’t much to look at because it is a long list with a search bar above it. It also gives users the options of downloading from magnet links as well as torrent files. There are a lot of torrent users who like the way some sites layout links to their content. This was a reason YIFY was so popular, and it is a theme many sites have followed. Torrentz2 does something very different, and all it presents you with is a search bar. This might be off-putting to some users because you can’t browse, you need to search for something in particular. The only drawback is the search results are not overly organized. This can take longer for you to find what you want, but as far as the amount of content, this is one of the best torrent sites which has masses of it, and it is fast when searching. 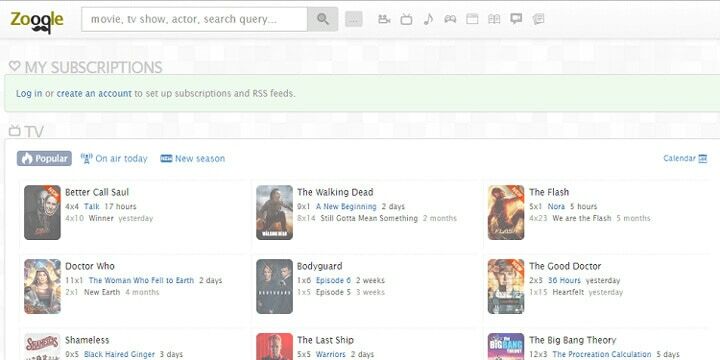 As of 2018, this was the third most popular torrent site for delivering torrent links through its directory. It has been around for 12-years which is a testament to its popularity, and also how the site owners manage to keep ahead of the law. This site is another which won’t show in a regular Google search, but it is there, and all you need to do is follow this link: https://www.1337x.to/. It is well designed and looks very similar to the site which began all those years ago. Being easy to use and navigate, there are vast numbers of movie and TV show links you can choose from. It is split into categories and serves up plenty of specialist content like anime. Torrenting of any kind can leave users open to receiving copyright infringement notices. Not only this, there are so many mirrors and proxies in use, it is hard to determine which are safe to use, and which ones aren’t. There is then restrictions ISP’s impose, this can be some of the above sites being blocked from New Zealand, or connections are throttled when downloading torrents. A VPN for torrenting can protect all users against these problems and much more. Your IP address will be masked, so no one will be able to see what you are doing, or trace anything back to you. A good VPN can also prevent hacking or malware. The thing is, New Zealand is so remote that not all VPN’s fully support the region. There is one option that hides you from view, delivers the fastest and most reliable torrent download speeds, and makes your connection pretty much impenetrable. 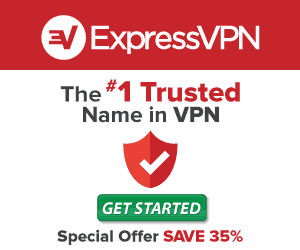 ExpressVPN is the most recommended company that can deliver this to all torrent lovers in this part of the world, or any other country safely and securely. Any torrent site can be accessed with no legal comebacks so users will be safe in the knowledge, they are using the best VPN to access any of the best YIFY alternatives.